Is there any tutorial or manual on how to create / save presets? I'd often need the same combination of 3 elements with many changes to the default-values, so I'd like to save these settings as a preset. This should be possible, right? You can use the page or block template functionality. Create a new page then save the block of elements in your block template library so that you can use it again in your pages. You can easily insert block of elements to your pages with the same configuration of elements that you saved. Hi nico, thank you for your help. How can I decide, wich part of an already made page shall be saved as a block? Right now I can only save the complete page, wich is not what I need. Regretfully, you cannot select which part, it will save it as a whole. As suggested by my colleague, you need to create a new page and add only the blocks that you want to use in multiple pages. After saving your block template you may delete the page. I understand what to do - but i don't think it makes sense to have to create a new page to get a preset-block. I can't see the advantage of this way. So it would be great if you could take this as an feature-request for cornerstone. We certainly appreciate the feedback! We'll add this to our list of feature requests. This way it can be taken into consideration for future development. All of these items are discussed with our team internally and prioritized based on the amount of interest a particular feature might receive. Thanks! 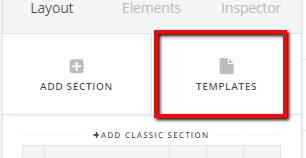 Is there currently a way to rename our own saved templates? Cornerstone only seems to occasionally give me the option to name my page/block when saved to library so my library is filling up with "My custom template (#)"
Yes, you can change it when you save. I see on the element I'm trying to create that there is an thing that says "apply preset." How to do create a preset? It seems like a "preset" is different from a "template," as the templates do not show up in this presets drop down menu. Also, how do I access the templates manager? I can't find it anywhere. That function is still under development same with template manager. Please check it here: https://theme.co/changelog/#theme-pro-1-2-0 under FAQs > What is next for Pro and its ecosystem of builders?